This stage is necessary when producing granular or pellet carbons to transform the raw material into carbonized carbon which is the first stage to make activated carbon. 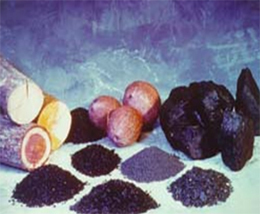 The carbon resulting from carbonaceous raw materials is very characteristic: it is a material which has an infinity of pores (a few Angstroms) blocked by organic material. To be transformed into activated carbon, this carbonaceous material has to be cleaned from all these organic materials. To do so, it has to be heated at high temperature (300° C) in a revolving or vertical kiln.